Thinking of starting a career as a public speaker or getting paid to speak, then learn first how to become a more entertaining speaker. Here are 10 ideas to improve your entertainment quotient as a speaker. 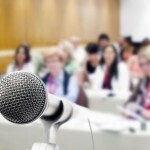 Are Seminars an Effective Way to Get Clients for Your Business? While many professionals and consultants have built successful practices through seminars, is this a strategy that will work for you? Seminars, workshops and bootcamps are big business. Learn how you can make money by holding seminars and workshops in this summary of Fred Gleek’s book.